We’ve heard about dual-touchscreen devices, about dual-SIM handets and even about phones that can use up to 3 SIMs, but a dual-device is surely new for us. Couple-IT is basically a twin gadget, that includes a dual-touchscreen cellphone and a laptop-style smartphone, introduced for the first time at Mobile World Congress 2008, in Barcelona. Each of them uses a SIM, but all of your content and information will be stored on both devices, as they’re permanently synchronized with the aid of the network in use. This concept was created by Alloy and it seems to be a sollution for those seeking an alternative to the Palm Foleo, or just another companion to ease your work. 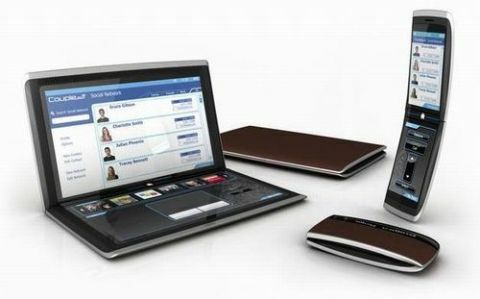 The dual-touchscreen handset is a clamshell device, while the “mini-laptop” is an ultracompact smartphone. Truth be told I fancy the clamshell phone more than the smartphone, as I was never a fan of companion devices and PDAs, in the era of handset shrinkage and slimmer phones. Atlas Kinetic Cellphone Concept Is “Mobilis in Mobile” MacBook Nano, Better Than MacBook Air?